Makona was remoed on 15th February and now lives with Lily and her humans !! Makona is a 3yr old male. 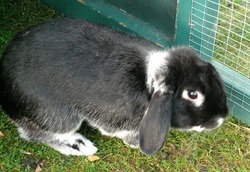 He is actually a lop-eared rabbit, although he sometimes forgets this and raises his right ear! He has beautiful colouring – mostly black but with what looks like a silver undercoat. 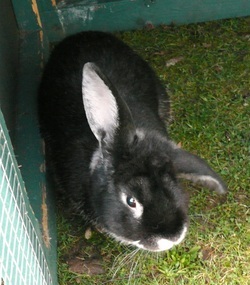 His previous owner kept him inside as a house-rabbit, but he has adapted well to living outside. When he first came in he had "weepy" eyes and there was concern that might have problems with tooth roots pressing on his tear ducts. However, after an extended course of antibiotic and anti-inflamatory drugs he has been given a clean bill of health. The early problems were due to infection in his tear ducts and we are hopeful that this wil not reoccur.